I have another great sci-fi themed tutorial for you today (the first being the Photoshop zombie tutorial). 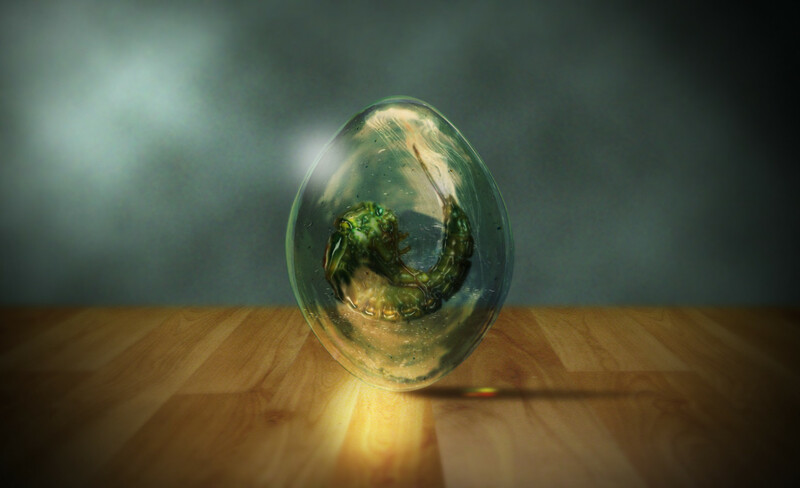 In this video tutorial we’ll create an amazingly realistic transparent alien egg using just 5 images. We’ll also create a background from scratch and add some cool highlights and shows to further enhance this effect. 02:20 – Create a background from scratch using the “Clouds” filter. 05:15 – Create a ground plane using an image of wood. 08:43 – Create a clear egg by manipulating an image of a bubble. 12:30 – Create an alien creature by manipulating an image of a salmonfly. 22:00 – Create highlight and shadows. 28:35 – Add bubbles & dust to the inside of the egg. 33:16 – Use an image of a jelly fish to create more egg details. 38:55 – Add color highlights to the ground plane. I really enjoyed and learned a lot from this tutorial, I made mine into a unique baby picture as a zygote! I would love to see your results, Bill! Feel free to share it with us! Did you make sure you had set the “Sample” to sample a color from “all layers”? that’s an option on a drop down on the top left? Yes there it was right in front of my face. Thanks for the response and the great tutorial! No problem Zoe! Glad you enjoyed it! How do you download the tutorial files? Nothing is happening when I follow the directions. Have you tried clicking on the “X” to the right of the social buttons? I did the tutorial !!! I am soo pleased how it came out, so easy to follow even though I am new to Photo Shop. Going to try out many more now . Glad you enjoyed the tut! Hi! I really loved your video, and i learned a lot! Here’s my picture if you want to see it! Awesome Amanda! Thanks for sharing it! There’s a gray “X” on the right that you can click on! It’s my work 🙂 Thank you! I have register and watch your amazing tutorial on the alien egg, but im not a member of any of the groups below to gain access to the alien egg files, … can you help me please? Click on the X to show the files! Thank you! Thank you!, I got the files as instructed and completed the “Alien Egg” I’m just a novice but i think my alien came out pretty good! I don’t have a website or fb nor any of the other social networks but would love to post my work here if i knew how. Once again you guys are great! and I’m following everything you do. You can upload them to a site like PhotoBucket and share the link with us! Hello, I started working on this toturial today and have run into some issues. The 1st issue is that my “shadow” seems to come out more like a brown circle then a shadow, even though I followed your exact instrutions. In addition I am unable to create a highlight. The only spot I can get the highlight to show up is when I am directly on the shadow. It will not appear on the background or on the table at all. I’m not really sure how to continue at this point. Any help would be great! As for the shadow, don’t worry about the color. Use a different one that works for you. Even if you fallow exactly what I do things may look different since we may be using a different color space, the calibration of the monitors will be different and the compression of the video will change things. Just use a color that looks good for you. If something is not appearing where you want it to appear, it may be because you have the wrong layer order or the blending modes are different. I did this tutorial about 3 years ago, so I don’t remember the specifics of the highlights, maybe if you have a screenshot or a specific question I can answer it. You’re welcome! And thank you for sharing! let me know what you think of it and what i can do better! I think it looks great! I loved that you took the tutorial and made it your own. Really good job! why did you remove my message????? …. at first I didnt see them when I placed this comment they suddenly show up sry …..
Just keep it up man, you are a one of a kind.